I’ve lost count of the amount of times that I’m asked do I provide a catering service. It’s lovely to have such a vote of confidence but I only bake and cook for ourselves, and occasionally my simple cupcakes for special events like the launch of the allotments. Last week a friend lamented that she can never make decent cupcakes at home, that they’re too time-consuming and that she hates standing over a mixer to make sure she gets a good result. At the same time she told me of a commercial bakery that had sold her cupcakes for a recent party that came nowhere near good quality. Maybe I have family and friends a little spoiled from my baking! After Tina put in a special request, here’s my recipe for simple cupcakes that has been adapted from The Hummingbird Bakery recipe. Truth be told I rarely make cupcakes, but rather make buns (which are smaller cakes) baked in bun cases. 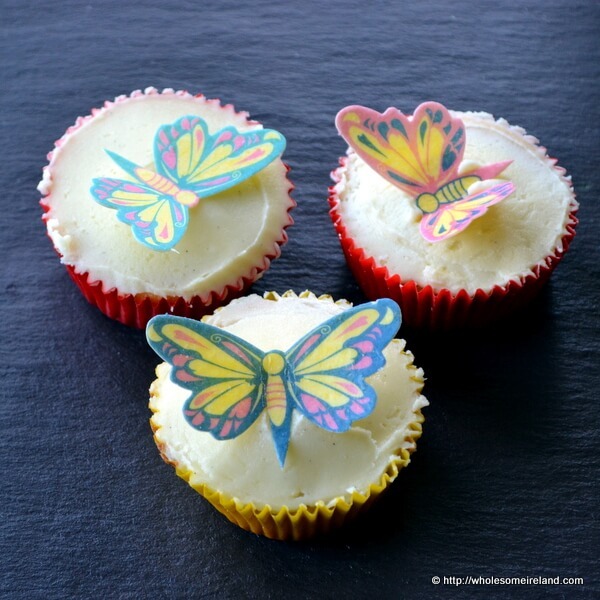 I used the bare minimum of my simple icing recipe to spread on top of the buns, then decorated them with some very pretty wafer butterflies that came from Dr Oetker (who provided a number of samples to me to test out in recent weeks). No more excuses, these are just too easy to make at home yourself! The beauty of adapting this simple recipe is that you should be able to make some great light cakes without the need for a stand mixer or hand whisk! Thanks Tash! The butterfly wafer lets my decoration skills off the hook! LOL. The kids love vanilla anything so this recipe is always a winner with us. I have to say Marty I far prefer it to a regular glaze. Happy Birthday to your little girl!